Happiness Is a Mood Not a Destination: Weekend Update! Happy Monday! I hope you all had a nice Fall/Halloween weekend and I cant wait to hear all about it! Ours was spent with family again. I couldn't help all weekend but wish we were dressing up and doing some Halloween things but honestly, nothing beats spending time with family! On Saturday my parents and I spent the day with my aunt. She, my uncle and cousins live up in Maine so we don't see them as often, so when we can find a day, we meet halfway between (an hour drive for both of us) and find fun things to do. This time, my aunt came alone. We decided to go explore a very nice park. 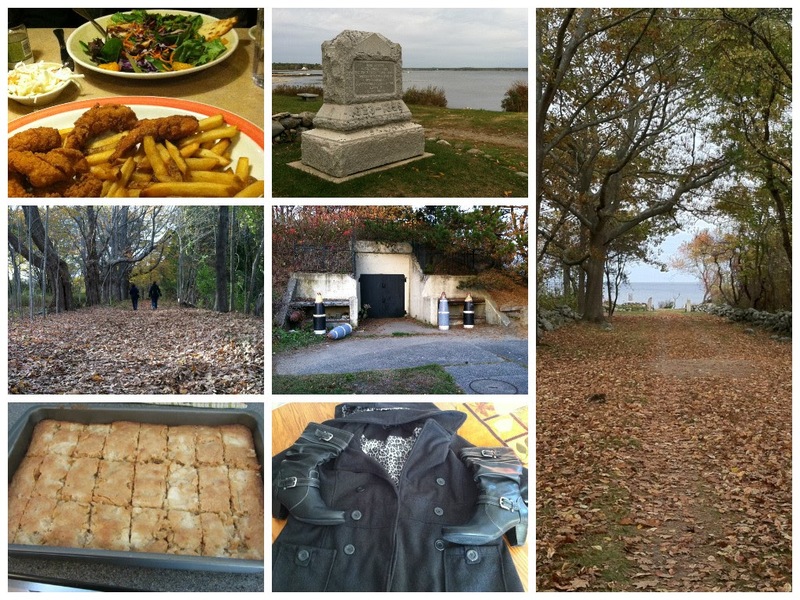 Which included walking trails, a science center, some interesting history, and the best part? It's located right along the ocean! It was a perfect Fall day! Leaves everywhere, awesome colors, but....a little cold. After walking for about 3 hours we went to dinner. Brian and I got engaged at a 99 restaurant which is an hour away from us, and just so happens to be 4 miles from the park we went to. We decided to eat there. We got engaged 3 years ago and neither of us had been back since that night. It was sad Brian couldn't join us this time but it was fun to think of the memories! We actually sat at the same table too. Yesterday my grandmother came over for lunch. Perfect relaxing afternoon with her! a) Dinner at the place Brian and I got engaged. b) My mom and aunt. The leaves covered the walking path. It was so pretty! e) Where they kept ammunition. The 4 pieces in the front were actually used. Have a happy Monday girl! Great pics! Love the fall ones. Sounds like a great weekend. Another New Englander! :) Sounds like a great weekend!